Call and get a quote today! NCHomeRemodeling.com, a division of NCWaterHeaters.com, offers home remodeling services covering every aspect of your project including design in Raleigh, NC and surrounding areas like Apex, Cary, Morrisville and Wake Forest. Below is a great look at some of the fantastic quality home improvement work we’ve showcased throughout the area in residential homes. For this project, starting with the homeowners wish list, we mapped out a design plan and provided several material samples for review and selection. The homeowner wanted marble tile, chrome fixtures, marble top vanity, custom vanity shelving, and a claw foot tub. What a fun project! You can see for yourself below. First, here are there original works before replacement. The existing shower and jetted tub were outdated and bulky. The existing vanity was too large for the area, outdated, and the mirror was dark and gloomy. Though the vanity was large, it lacked usable storage. Part of the solution to making this bathroom a relaxing retreat included replacing the windows, slightly increasing the size of the shower, using a large marble tile and adding a niche, changing the shower door to frameless glass that extends to the ceiling, and adding a clawfoot tub. The new shower and tub! A smaller vanity was selected in order to have space to angle the new tub and not overwhelm the space. The marble top blends nicely with the marble tile and the chrome fixtures throughout brighten the bathroom. The custom made center shelving extends to the ceiling along with the new custom vanity mirrors. Everything was painted a medium gray, and all of the trim as well as the ceiling was painted a bright white. The remaining fixtures were replaced and a new low-flow toilet installed. This master bathroom has gone from outdated and lacking space to a bright, open, luxurious, and calming retreat. We loved what we were able to do with this project and so were the owners! NCHomeRemodeling.com, a division of NCWaterHeaters.com, provides complete home remodeling services in Raleigh, NC and surrounding areas. Visit our website, check out our reviews, and contact us for an estimate. No Replies to "See Our Work: Creating a Master Bathroom Retreat"
NC Home Remodeling provides complete home remodeling services in Raleigh, Durham, Chapel Hill, Wake Forest, Cary, Garner, Clayton, Apex, Fuquay-Varina, Holly Springs and beyond including the counties of Wake, Harnett, and Johnston. 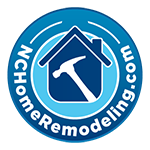 At NCHomeRemodeling.com our trusted team is available 24/7 to handle all your emergency plumbing and water heater needs. Call for reliable, respectful service at prices that won’t break your budget.